Step 1 – Carefully review recipes confirming that all necessary ingredients are present and accounted for. Step 2 – Lug the KitchenAid into the kitchen from the dining room. Step 3 – Pull out every conceivable bowl, spatula, and measuring utensil and crowd them on the counter. Step 4 – Following the recipe, make bread dough. Notice how inelastic the dough is and how easily it breaks and tears as I knead it. Wonder if I have over kneaded the dough. Set it aside for one hour to rise. Step 5 – Wash the first load of dirty dishes. This takes approximately the same amount of time as the bread’s first rise. Step 6 – Punch down the dough, divide it into portions, and shape three loaves. Again notice how the dough is tearing and breaking as I work it. Place shaped loaves on a baking sheet, cover, and let rise for one hour. Step 7 – Following the recipe, make cake batter. Bake cake during the bread’s second rise. Step 8 – Wash the second load of dirty dishes. Step 9 – Put all the ingredients back into their proper cabinets, drawers, and cubbies. Step 10 – Discover that instead of all purpose flour, I had used bread flour for both the bread and the cake. Now, you might be asking yourself why using bread flour instead of all purpose flour, especially in a bread recipe, is a deal breaker? While I”m sure that there is a very simple explanation in one of the cookbooks at home on my shelf, the easiest way that I can explain it without having them in front of me is to say it’s all about the protein. Bread flour has a higher percentage of protein than all purpose flour and because of this difference, the two are not always interchangeable. If I were able to channel the minds of Rose Levy Beranbaum or Shirley Corriher, I could expound on how the two flours behave differently, require different levels of hydration, and sometimes benefit from other helper ingredients. Since I can’t do that, all I can tell you is that this specific bread baked up heavy and leaden. I could have used it as a doorstop. And the cake? It was tough. We nibbled at both but ultimately cut our losses and moved on. And then I went to the store, stocked up on all purpose flour (that’s King Arthur in the RED BAG, not the blue bag), eggs, and yeast, and gave the bread another try. Challah 2.0 was definitely an improvement but I know Rose has a Challah recipe in The Bread Bible. I may need to get over my reluctance to really commit to my Bread Bible Studies and just hit the books. 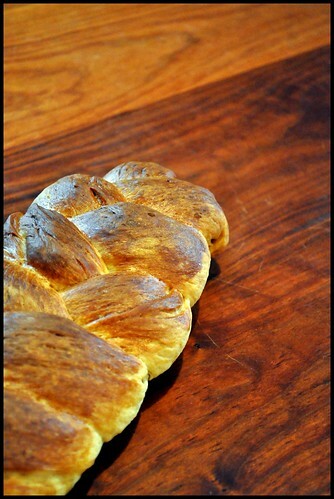 I’m going to send you over to see Alyssa for her Challah recipe. Please note that the recipe should read 1 1/2 Cups melted Crisco. And you may want to wait until the bread has been in the oven for 30 to 45 minutes before brushing it with the egg. The first batch came out utterly shellacked when I applied the wash before putting the loaves into bake. The second batch, pictured above, developed a lovely color with the wash on for the last 30 minutes but didn’t break my teeth as I tried biting into a slice. Ah, steps 5 & 8. Sometimes I think they’ll do me in. Especially when I’m making my grandmother’s meatballs and sauce. Love the woman and her legacy of amazing Italian dishes, but for real, did she have to use so many pots and pans and mixing bowls? CK, I think my claim to fame will be my superhero-like power to break recipes. And I must admit that I will often choose not to make an otherwise tempting recipe if it even looks like it involves too many dirty dishes. To think that before dishwashers, people had no choice but to endure dish pan hands and cooked anyway! PS – Thanks for stopping by. Your Yes post really did resonate with me. I hope folks will click on this here link http://badmommymoments.com/2010/05/17/project-yes/ and go take a read that has nothing to do with me whining about dirty dishes and broken recipes or the current lack of carbs and sugar in my diet. Beth, I love the idea of immersion blender as a magic wand. If Harry Potter wore a chef’s toque, imagine the magical properties our kitchen tools would have. Dear JK Rowlings, if you write a novel with this premise, you can email me directly to find out where my creative consultant royalties check should be sent. Please and thank you. Funny after the fact. Not so much in the moment. Just the title of this post had me chuckling. Love an honest girl like you. Agreed, I love your honesty. And it seems like you kept things pretty organized in the kitchen – washing dishes, putting everything back in its place. As for breaking recipes, I’ve been doing the same recently. I like to think my mess-ups make for more interesting blog posts. And at least you’ll know what to do next time! Oh Jen, if you saw the size of my kitchen, you’d understand that the washing and putting away is out of necessity. And broken recipes do make for more interesting reading. Besides, how can you take someone seriously who never admits to getting it wrong? Statistically, it is impossible for someone not to have a fail at some point. OH DEAR! Perhaps you simply have a case of Cooker’s Block! Emily, more likely a case of Chopping Block!